Hotel Residenza Parco di Mileto. In one of the most beautiful places in the South of Italy lays Hotel Parco di Mileto. 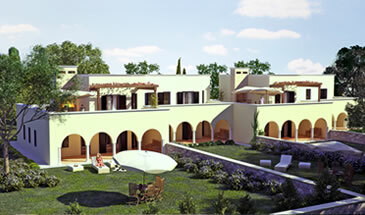 The hotel under construction lays as a beautiful island between the hills of the Murge and the Adriatic Sea. Even for Italian standards it is an unique project in all its aspects. Hotel Parco di Mileto is located in the region Puglia, also known as the pearl of the South of Italy, close to famous places such as the ‘ white town’ of Ostuni, the trulli of Alberobello, the culinary restaurants of Fasano and romantic Polignano al Mare with the spectacular views over the blue waters of the Adriatic Sea. It is a special piece of ‘the real ‘ Italy in the valley between the cities of Bari and Brindisi. 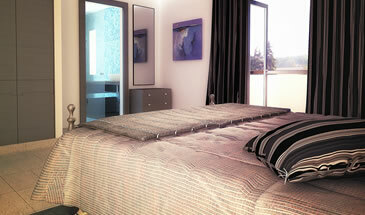 Are you considering a stay in an Italian villa or apartment? Hotel Parco di Mileto is definitely your best choice. The spacious Hotel Villas and Hotel apartments are individually designed with a distinctive architecture that is characterized by its unique combination of traditional classical and modern elements. Beautifully situated in the lush countryside with views over the centuries-old olive trees and the slopes with Mediterranean gardens. The Hotel Villas and Hotel apartments are situated in the best possible way in the landscape to benefit from the natural light in every season. The indoor areas blend in naturally with outdoor areas. Ample green areas ensure optimal privacy. The design of the Hotel Parco di Mileto, and its Villa’s and Apartments, is an unique balance of the typical Pugliese architecture from the past and present and the highest northern European standards for modern luxury and comfort. Thanks to the design that respects the local natural environment it looks as if Parco di Mileto has always been there. Hotel Residenza Parco di Mileto – For an unforgettable stay at a special location where you want to return time after time again!